This Falmouth, MA home looks great with new vinyl siding and replacement windows! 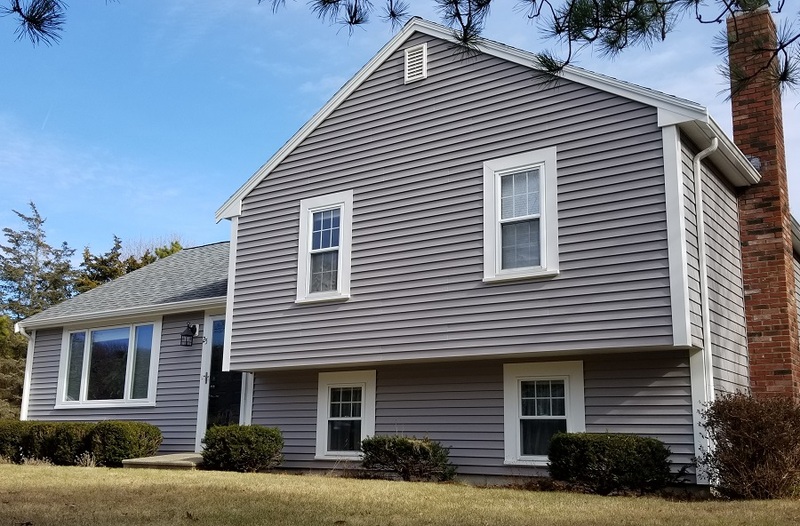 The homeowner chose a classic, Cape Cod combination of Mastic Cedar Discovery and Mastic Carvedwood 44 vinyl siding in the color, Harbor Grey, for a maintenance free exterior. Mastic Cedar Discovery is manufactured to replicate the look of painted cedar shingles and Mastic Carvedwood 44 mimics the look of painted cedar clapboard siding. With realistic textures and shadow lines, this siding is virtually indistinguishable from its natural wood cousins. Both vinyl siding styles come in a beautiful collection of fade and dent resistant colors for lasting beauty and curb appeal. This professional grade siding is also made to withstand high winds – making it a great choice for New England homeowners. 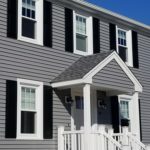 Learn more about the installation process with our 4 W’s of Vinyl Siding blog – we explain which siding is best, what to expect during installation, who to hire, and why you should make it Care Free! Harvey Classic double hung replacement windows and a Harvey Picture window flanked by Harvey Casement windows were also installed. The double hung windows tilt-in while the casement windows extend to a 90 degree angle for easy cleaning from the inside. All window styles were custom made and provide energy efficient style. Our top-selling replacement and new construction windows, Harvey products are manufactured right here in New England and come in an fantastic collection of styles, colors, and glaze options. Care Free Homes is one of the few regional contractors to be a selected as a Harvey Elite Series dealer. The Elite series combines the beauty of a traditional Harvey Classic window with a triple glaze for an ultra energy efficient performance! In addition to our fantastic warranties from product manufacturers, we stand behind every home improvement project with a 10 year workmanship guarantee. 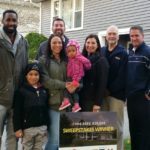 Since 1978, our family has been honored to serve thousands of Cape Cod, Southeastern Massachusetts, and Rhode Island homeowners. 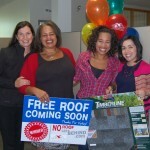 We invite you to join the Care Free family and get a free quote! Give us a call at (508) 997-1111 or submit your request online and we’ll follow up with you. Get started and make your house a Care Free home!